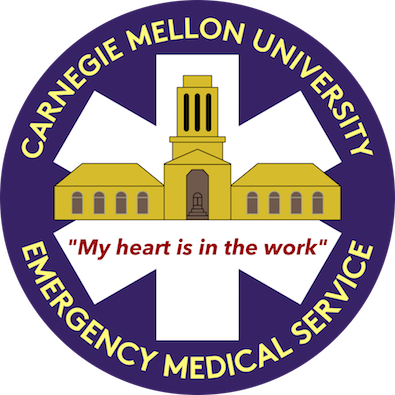 CMU EMS welcomes any member of the Carnegie Mellon campus community—students, alumni, faculty, and staff—at any experience level. Members share a common commitment to community service and helping others. Registration is now closed for this semester! Come back at the start of next semester when applications will be open again. Or contact us if you really want to get in touch. I know nothing about emergency medicine, but it sounds really interesting. Is CMU EMS for me? Absolutely! We are more than happy to teach you everything you need to know, and before you know it you'll be leading calls and teaching others what you've learned. Many of our most successful volunteers started out without any prior knowledge or experience. I have years of experience as an EMT/Medic/Doctor. Why would I join this group of newbies? CMU EMS has a lot to offer to more experienced practitioners. First, it will provide an opportunity to keep your skills sharp while making an impact on your local campus community. And besides that, volunteering will give you a unique chance to share your knowledge with willing and able colleges in a relaxed setting. Serving a college campus is a unique and rewarding experience. Will my current CPR or EMT certifications be accepted? Current PA EMR, EMT, or Paramedic certifications are accepted, and we can help you apply for reciprocity if you are certified in another state. Please contact info@cmuems.org prior to training to confirm that your certifications are valid. We can only accept your CPR Certification if it is AHA Basic Life Support CPR for Healthcare Providers (AHA BLS HCP); if you don't have this certification, you will receive it at new member training. How are you really able provide professional-level care when you are only students? CMU EMS is recognized by the state of Pennsylvania as a Basic Life Support Quick Response Service. In other words, we are held to the same standards as other BLS service in Pennsylvania. We have at least one EMT-Basic on every call and we follow the BLS Protocols under the direction of an Emergency Medicine Physician. We may be students, but we are professional emergency responders trained to a high level. Lights and sirens are cool! That's not really a question... but we think so too! CMU EMS operates a nontransporting vehicle to responsibly respond to our calls, occasionally, with all the lights and sirens. Members may also respond on foot or on a bike if the location is a little closer. What do you do besides responding to emergency calls? CMU EMS offers CPR and First Aid classes to the campus and the general public. We have also been known to go camping and hang out in our quarters. My friend does EMS and it's taking over his life. If I commit to this, will I have time for other activities as well? Joining EMS is definitely a commitment, but it's one that you won't regret. Taking shifts is easy, and you can usually do other things at the same time as being on call. The minimum requirement to stay active is two shifts (48 hours) per month and attendance of general body and training meetings. Blood makes me queasy, but I still would like to help out with CMU EMS. What opportunities are there for me? We're always looking to accept non-medical members. Supporting members often help with trainings, run some of our operations, or just have a good time with the EMS members. Don't hesitate to apply! What exactly are the steps of training? What can I do to get ready for my interview? What exactly are you looking for? We will email you with details about the interview after you apply. Dress and attitude are casual. Please just be yourself and tell us who you are. We are really interested in your personality and your reasons for joining EMS. There will be no technical questions, and no medical knowledge is assumed. The rewards of our work are intrinsic. If you are willing to commit your time to training and taking shifts, you will eventually find that you know what to do in dire situations. See How to join or visit us at the activities fair or email us at info@cmuems.org We will add you to the recruitment mailing list and invite you to our next information session. Until then, feel free to visit us at our shift change—Doherty Apartments B tower basement at 9pm (call the office number below to get in).